Traditionally, red ginseng, also known as Panax ginseng, has been taken as an aphrodisiac, as a stimulant and to increase longevity. Used in China as a treatment for diabetes and male sexual dysfunction, ginseng root has been a highly prized herb for thousands of years. Although a widely used and highly regarded medicinal agent when used appropriately, there are concerns about the wide range of side effects and drug interactions from the long-term use of the ginseng plant for more than three months. It is generally well tolerated, but caution should be taken when consuming any herbal medicine. Some people experience headaches, dizziness and vertigo while using ginseng. Using ginseng may also cause nervousness, restlessness, anxiety, a sense of being over-stimulated, excitability, depression, confusion, insomnia and manic episodes in people with bipolar disorder. Those especially who smoke and drink coffee in combination with ginseng have been shown to have an increased risk of an irregular and fast heartbeat, as well as incidents of congestive heart failure. Both high and low blood pressure have been observed in people using red ginseng. People taking blood pressure medications for high blood pressure should avoid taking red ginseng. Ginseng may also increase the risk of vaginal bleeding and general bleeding during surgery. Ginseng should be discontinued before all surgical procedures. Drinking coffee and smoking tobacco products increases the risk of bleeding. Ginseng has been shown to have an effect on blood sugar by significantly lowering it. Those with diabetes should use extra caution if taking ginseng, especially if they are using blood sugar-lowering medications or similar herbs. 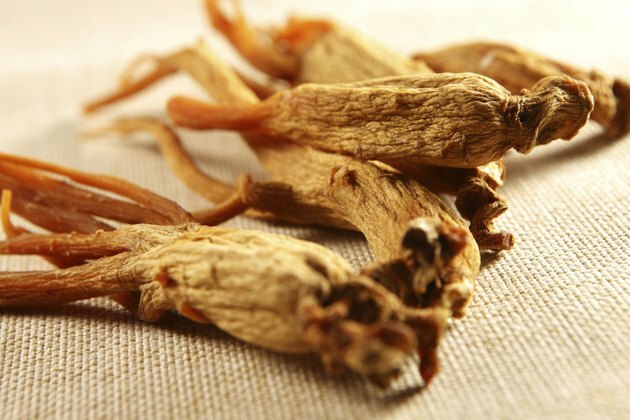 As well, long-term use of red ginseng can produce gastrointestinal problems, including nausea and vomiting. Breast tenderness, loss of menstrual periods, breast enlargement in men, difficulty developing or maintaining an erection, and lack of libido have been reported in both sexes. Avoid using ginseng if you have known hormonal problems or hormonally sensitive conditions such as endometriosis, breast or uterine cancer. Do not consume ginseng during pregnancy or while breast-feeding, since there is a possibility of adverse effects on the fetus and newborns. Because of ginseng's ability to cause bleeding, care should be taken when using it while taking medications that thin the blood. Examples include aspirin, Heparin and other blood thinners, anti-platelet drugs such as Plavix, and NSAIDs such as ibuprofen and or naproxen. Avoid combining ginseng with MAOIs to avoid potential headaches, insomnia, mania and tremors. Red ginseng may alter the effects of certain blood pressure or heart medications such as calcium channel blockers. Ginseng can decrease the effects of the diuretic drug Lasixx. Consult a qualified medical practitioner before combining any form of ginseng with heart or other medications, including herbal preparations.